THE GLENLIVET WHISKY ETCHED GLASS TUMBLER. SURFACE MARKS MAY BE NOTICEABLE, HENCE THE CHEAP PRICE. 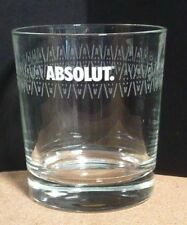 A RARE AND COLLECTABLE ABSOLUT VODKA GLASS TUMBLER. ABSOLUT IN WHITE TO FRONT. WITH ALL ROUND ETCHED ABSTRACT DESIGN TO TOP OF GLASS. HEAVY BASED GLASS. NEW - UNUSED. AS WE TAKE GREAT PRIDE IN ENSURING THAT YOU RECEIVE YOUR ITEM IN PERFECT CONDITION. Glass tumbler, with a bubble in the base. etched with a Scotland flag, inscibed lower edge. Natural wear and tear, utensil scratches, gilt wear, stilt marks, light natural crazing and firing faults. SMIRNOFF VODKA TALL ETCHED HI BALL GLASS TUMBLER. NEW. THREE BARRELS. SHORT ETCHED TUMBLER. APPROX 8 CMS TALL. I HAVE LOTS OF GLASSES LISTED. I have also added a Famous Grouse shot glass. ^;^. Especially If You Happen To Be A Cosmonaut From Mongolia!! Therefore. The Mier Space Station To Outer Mongolia - Estimate Only! 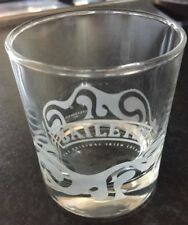 A lovely set of Whisky tumblers that are etched with "Bell's" whisky logo. Made by Arc France, a very good quality glass. Baileys tulip tumbler Glass. Vintage ETCHED logo preowned. 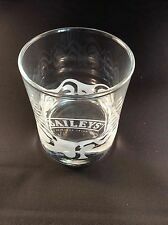 Baileys Tumbler Glasses x 2 NEW Quality heavy base bubble etched Great Gift! Stylish Baileys Tumbler Glasses x 2. Retro Matching PAIR OF WHISKY/SPIRITS GLASS TUMBLERS. Great Party Glasses & prepare for Christmas! White Horse.Black & White.King George.Canadian Club. Plenty of room. browse around ~ you never know what little gems you'll find!". Retro Matching PAIR OF WHISKY/SPIRITS GLASS TUMBLERS. Great Party Glasses & prepare for Christmas! Plenty of room. browse around ~ you never know what little gems you'll find!". ~~~~~~~~~~~~~~~~~~~~~~~. The first is for BELL'S EXTRA SPECIAL and the second is for WHYTE & MACKAY. Used but in really good condition. A pair of Baileys Irish Cream liqueur tumbler glasses. Would make a lovely gift. Approx size 10.5 cm tall x 7.5 dia. Whisky Tumblers 6x Whisky Glasses Partridge Etched on Front 1800-2000 Le Bicentenaire on Rear. Retro Matching PAIR OF WHISKY/SPIRITS GLASS TUMBLERS. Perfect to enjoy your favourite Drinks from. for ice and mixing! Plenty of room. Finished in a clear good quality Glass & Vibrant Green & Black. Bell's Extra Special Tumbler Glasses x 2 Quality heavy base etched Great Gift! Stylish Bell's Extra Special Tumbler Glasses x 2. The unsurpassed quality and sooth character of The Famous Grouse finest Scotch whisky for one hundred years. New listing2 x SMIRNOFF VODKA TALL ETCHED HI BALL GLASS TUMBLERS. NEW.